As a licensed Esthetician I am a firm believer that as the weather changes so should a few of your beauty products and skin treatments. When the weather is drier and colder your skin will have different needs and in return will respond differently to products you were using in the hotter months. 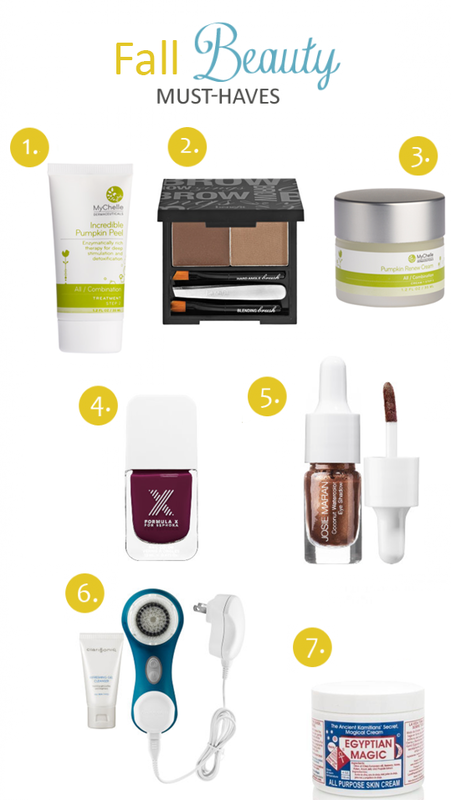 Below are a few of my favorite beauty and skin products for fall, which is quickly approaching and I can't wait! 1. MyChelle Incredible Pumpkin Peel: This is a current favorite of mine right now. It smells heavenly and gives your skin the ultimate glow while gently exfoliating the dead skin cells away. Best when used 2-3 times per week. 2. Benefit Brow Kit: Until a few months ago I never filled in my eyebrows but ever since I have been using this, I can't imagine not ever filling them in again! I love the super natural look it gives your brows without them looking drawn in or too harsh. 3. MyChelle Pumpkin Renew Cream: Many of you have asked me what I use for my moisturizer and this is it. It is packed full of incredible ingredients such as acai, pumpkin seed oil, micro-algae, Camu Camu (which contains the highest documented quantity of natural vitamin C on Earth) and more. It leaves my skin looking and feeling hydrated without ever making me feel oily or breaking me out. 4. Sephora Formula X Nail Polish: Have you tried this brand yet? I am obsessed! It is by far the best nail polish that I have ever used. It makes your nails look like you are wearing gel and it stays on for days! I'm currently all about plums and grays. 5. Josie Maran Coconut Watercolor Eyeshadow: I am loving metallics for fall and this creamy based eyeshadow is so so good. It hydrates your eyelids and the color stays on effortlessly for hours. 6. Clarisonic Mia: I am a big fan of this! I always recommend holding off on too much exfoliation or peels during the summer but once the weather starts to cool and you are able to avoid the sun a little more it's the perfect time to incorporate this gentle and amazing exfoliating system into your beauty routine. It creates noticeably healthy skin and helps reduce the appearance of pore size. 7. Egyptian Magic: This wonderful all natural and all purpose cream is my go-to product once fall hits and my skin becomes dry. You can use this on the bottom of your feet to relieve cracked heels, as a hair masque, wound healer, a shaving balm and so much more. I love Formula X nail polishes! I want to share with you and your readers a Beauty Deals blog where you can find all the beauty deals that are happening http://beautydealsonestop.blogspot.com. I am a loyal reader to your blog btw :) I have type 2 diabetes, but I can relate to a lot of things that you wrote about type 1 diabetes. Thanks for all the great recommendations! Do you have a cleanser you like for Fall? Also, are the MyChelle products good for fine lines/maturing skin? Love Egyption Magic and I think its time to invest in the Clarisonic! Hope you had a great weekend! Stephanie- You are welcome :) I actually really love the MyChelle Cleanser as well! And yes the MyChelle line is great for maturing skin. How often do you recommend using electronic brushes per week? I have the Mary Kay electronic brush (very similar to the Mia 2) and I use it about once a week. Is that too much or not often enough? I had to laugh at the last one. Oh man if you could see my feet right now. Tore. Up. Do you recommend washing with the Clarisonic every time you wash your face? Or just once a day (or even less frequently)? Thanks! Marjorie & JM- everyone's skin is different and has different needs but as a general rule 3-4 times per week is what I usually recommend. Always enjoy reading your beauty posts! Still looking forward to your best Drugstore Beauty Finds Part 2!